We love working with food trucks. In general, our text marketing service and the food service industry are a match made in heaven. We love helping food trucks fire out unique lunchtime offers, encourage subscribers to engage on social media, and reward loyal patrons. Here are a few more reasons why your food truck needs text marketing. Fire out daily/weekly location information. Don’t rely on social media as your #1 communication source. Happy Monday! We’re starting off the week at Southside Park Garage from 2-5PM. Stop down and get your grub on! The best way to encourage people to buy? Limited time specials. For example, let’s say your tacos in a bag are a crowd favorite. Every Wednesday, text out a deal that reads something like this. We’re all about that taco life! Show this text today from 1-3PM for a buy one taco in a bag, get one free deal. We love encouraging every single user to run a text to win contest. The best way to grow your list? Offer a grand prize that proves to be irresistible. Want to win a dozen red velvet cupcakes from Sandy’s Sweets? Text YUM to enter, winner announced tomorrow at 3PM. Want to learn more? 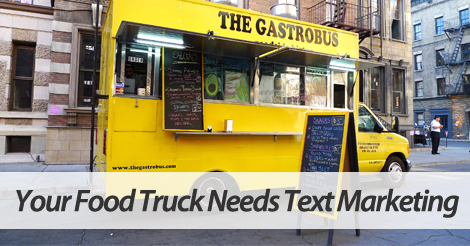 Check out our best text marketing tips for food trucks. We’ve worked with hundreds of super cool food trucks, and would love to add you to the list. Partner up with the top text marketing service for food trucks, SlickText.com. Give us a buzz at 1.800.688.6290 to learn more, or head over to the pricing page and sign up for a free plan. Not necessarily a phone person? Shoot an email over to info@slicktext.com. We’ll respond to your inquiry within 24 hours or less. To keep it simple, we’ve got everything you need to succeed.